Jared D. Peterson | Fafinski Mark & Johnson, P.A. Jared Peterson brings experience, knowledge, and insight to the full spectrum of legal issues facing businesses today. Born and raised in New Ulm, Minnesota, Jared has been a trusted legal advisor for cooperatives and other agribusinesses throughout his career. In addition to serving as an advisor to clients, Jared is an experienced litigator. He has represented clients in bench and jury trials, as well as appeals to the Minnesota Court of Appeals, Minnesota Supreme Court, and the United States Court of Appeals for the Eighth Circuit. From the initial stage of starting a business to addressing complex merger and business succession issues, Jared represents clients in a wide range of business transactional matters. One particular focus of Jared’s business representation has been assisting clients with credit procedures and the collection of their account receivables. In addition to representing business clients, Jared represents numerous individuals in wrongful death and personal injury cases, and assists individuals with their estate planning and probate needs. Jared is a Certified Alternative Dispute Resolution Neutral by the Minnesota Supreme Court and a member of the Ninth Judicial District and Minnesota State Bar Associations. 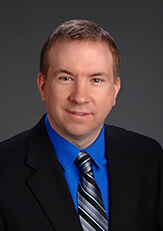 He currently serves as the Chairman for the Agricultural and Rural Law Section of the Minnesota State Bar Association. He is also an investigator for the Ninth District Ethics Committee and on the Board of Directors for several organizations. Jared returned to practice law in his hometown of New Ulm approximately 17 years ago. In his free time, he enjoys traveling and taking advantage of Minnesota’s great outdoors.